In her most creative and instructive cookbook, Julia Child distills a lifetime of cooking into 800 recipes emphasizing lightness, freshness, and simplicity. Chapters are structured around master recipes, followed by innumerable variations that are easily made once the basics are understood. For example, make Julia’s simple but impeccably prepared sauté of chicken, and before long you're easily whipping up Chicken with Mushrooms and Cream, Chicken Provençale, Chicken Pipérade, or Chicken Marengo. Or master her perfect broiled butterflied chicken, and you’ll soon be including Deviled Rabbit or Split Cornish Game Hens Broiled with Cheese on your menu. Here home cooks will find a treasure trove of poultry and fish recipes, as well as a vast array of fresh vegetables prepared in new ways, along with bread doughs and delicious indulgences, such as Caramel Apple Mountain or a Queen of Sheba Chocolate Almond Cake with Chocolate Leaves. And if you want to know how a finished dish should look or how to angle your knife or to fashion a pretty rosette on a cake, there are more than 600 color photographs to entice and instruct you along the way. A brilliant, inspiring, one-of-a-kind, book from the incomparable Julia Child, The Way to Cook is a testament to the satisfactions of good home cooking. "Julia Child's . . . seventh book, The Way to Cook, is her magnus opus . . . the biggest and most comprehensive collection of Child recipes and comments . . . (with) the same warm, generous, informal approach that has made her the most celebrated cook in America".--Phyllis Hanes, Christian Science Monitor. 600 full-color photos. Blending French cooking techniques with free-style American cuisine, this lavishly illustrated cookbook features step-by-step directions for creating a rich variety of delectable dishes. Reprint. 50,000 first printing. $75,000 ad/promo. In this magnificent new cookbook, illustrated with full color throughout, Julia Child give us her magnum opus--the distillation of a lifetime of cooking. And she has an important message for Americans today. . .
--and to all of us: above all, enjoy the pleasures of the table. 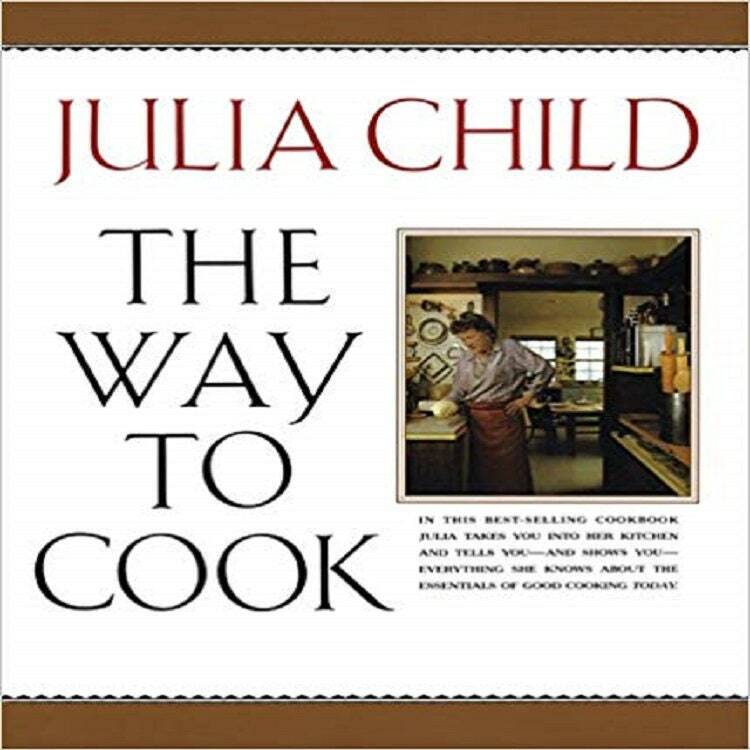 In this spirit, Julia has conceived her most creative and instructive cookbook, blending classic techniques with free-style American cooking and with added emphasis on lightness, freshness, and simpler preparations. Breaking with conventional organization, she structures the chapters (from "Soups to "Cakes & Cookies) around master recipes, giving all the reassuring details that she is so good at and grouping the recipes according to method; these are followed--in shorthand form--by innumerable variations that are easily made once the basics are understood. For example, make her simple but impeccably prepared saute of chicken, and before long you're easily whipping up Chicken with Mushrooms and Cream, Chicken Provenale, Chicken Piperade, or Chicken Marengo. Or master her perfect broiled butterflied chicken, and next time Deviled Rabbit or Split Cornish Game Hens Broiled with Cheese will be on your menu. In all, there aremore than 800 recipes, including the variations--from a treasure trove of poultry and fish recipes and a vast array of fresh vegetables prepared in new ways to bread doughs (that can be turned into pizzas and calzones and hamburger buns) and delicious indulgences, such as Caramel Apple Mountain or a Queen of Sheba Chocolate Almond Cake with Chocolate Leaves. And if you want to know how a finished dish should look or how to angle your knife or to fashion a pretty rosette on that cake, there are more than 600 color photographs to entice and instruct you along the way. A one-of-a-kind, brilliant, and inspiring book from the incomparable Julia, which is bound to rekindle interest in the satisfactions of good home cooking. Julia Child was born in Pasadena, California. She graduated from Smith College and worked for the OSS during World War II; afterward she lived in Paris, studied at the Cordon Bleu, and taught cooking with Simone Beck and Louisette Bertholle, with whom she wrote the first volume of Mastering the Art of French Cooking (1961). In 1963, Boston’s WGBH launched The French Chef television series, which made Julia Child a national celebrity, earning her the Peabody Award in 1965 and an Emmy in 1966. Several public television shows and numerous cookbooks followed. She died in 2004.